Quite a few people have asked why we don’t have to input the time of each weather observation. It’s a sensible question, and we do need the observation times, particularly for tracking fast-changing weather events like moving fronts. But one of the clever features of the the oldweather website is that we don’t have to enter the times – they are automatically collected through the process of entering the weather data. To do this we take advantage of a symmetry between space and time in the logs (scientists love symmetries). The top of each log page corresponds to the beginning of the day, and the bottom of the page corresponds to the end of the day. So the further down the page an entry is, the later in the day it was taken. We record the position of the push-pin for each entry digitised from the page and from that push-pin position, we can find the time associated with that entry. The image below shows the positions of all the weather observations entered from the logs of HMS Bacchante (thanks captain richbr15, lieutenants dazedandconfused and davemcg, and all the crew). Positions of all weather observations entered from the logs of HMS Bacchante. Red points are on left-hand pages, blue points on right-hand pages. 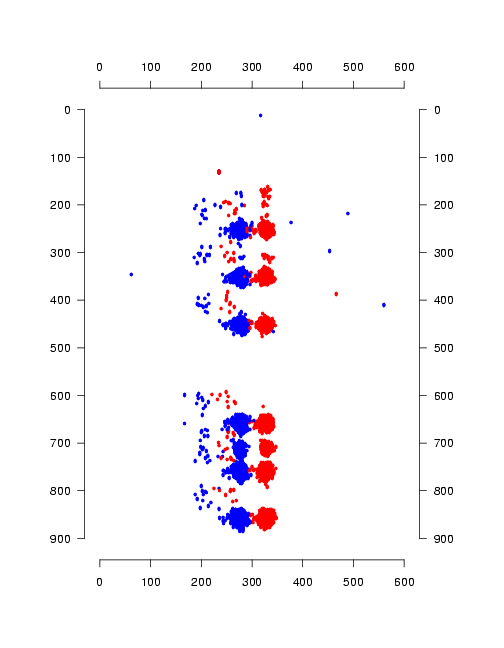 As with most books, there are two sorts of pages: left-hand (red dots) and right-hand (blue dots). They have different margins in our images, so they don’t line up precisely horizontally, but their vertical position is the same, and that’s what gives us the time. The Bacchante recorded the weather at the end of each watch: so at 4, 8 and 12 a.m., and the same times in the afternoon. They also recorded it at the end of the first dog watch (6 p.m.) – so we should expect to see three equally-spaced groups of points in the top half of the figure (the morning), and four, more irregularly spaced, groups in the bottom half (the afternoon). This is exactly what we see, and it’s clear that for the vast majority of the observations, we can easily say which watch they are associated with, and so when they were taken. There are a few observations that are not quite so easy – we can see some smaller clusters of observations above and to the left of the main clusters; but again, it’s easy to see which watches there observations correspond to. There are also a few observations in irregular positions – lost in time and space – but these are only a tiny fraction of the total. So it’s going to be easy to find the time of observation in the usual case where the observations are 2 or 4 hours apart. For the diligent few log-keepers who recorded observations every hour or even more frequently, we will have to be a bit cleverer; and use the differences between the observed weather values, as well as the position on the page, to group the observations into clusters and assign them to times. All this, of course, relies on having accurate positions on the page for each observation, which means lining up the entry box with the observation text carefully each time when entering the data. So far, we’ve done well at this (as the figure shows); I’ve come to expect no less from oldweather, but it’s still a pleasure to see. There may be a potential issue with the method to extract the time from the sequence the data is entered. Editing a data field in a previously entered log will put that log at the end of the list. For example. : you entered 3 climate logs and discover that the first one you entered contains a typo. If you edit it, it will jump to position 3. Editing should not alter the sequence of the logs. I agree that It’s not ideal that editing data after entry changes the sequence the entries are displayed in; but fortunately this doesn’t cause problems with the times of the entries, because editing doesn’t change the position we record for the push-pin. So we can still get the time from edited entries.